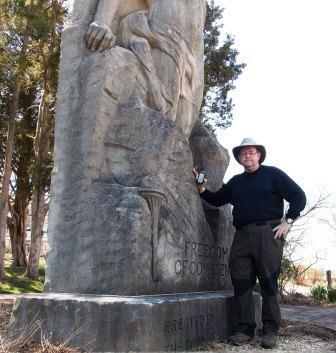 In the early 1800's, Marylanders began to commemorate the "lost city" of St. Mary's as a place of special significance. The 300th anniversary of Maryland's founding in 1934 brought renewed attention and enthusiasm. The State House replica was built, a huge celebration drawing over 100,000 people was held, and this statue was commissioned. It honors religious tolerance, a right secured to all citizens of Maryland by "An Act Concerning Religion," passed in the General Assembly in 1649. 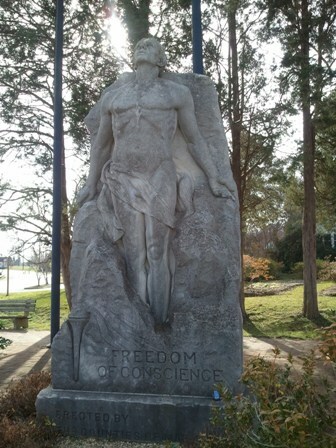 According to the sculptor, Hans Schuler, his work "represents the liberation of the spirit that had for so long been bound by intolerance...The torch represents the flame that kindled this fire of religious freedom throughout the world." LOGGING REQUIREMENTS: The Log Password will be the 2nd word on the 4th line on the rear of the sculpture. 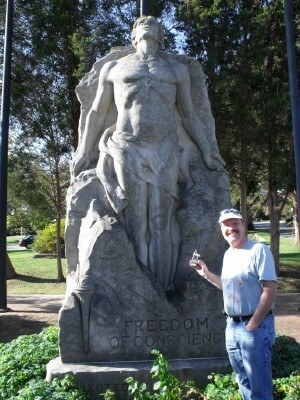 In addition to this, you will need to post a photo of you and / or your GPS with the sculpture. Be sure not to include the required info in your photo. Intended to log this find last year when I passed through St. Mary's on the way to another CAM cache. No matter, stopped by again today to revisit this fine memorial and snap a few more pictures. I was driving through the area today to find a couple of terracaches, and made the stop to find this one. Thanks for bringing me here!